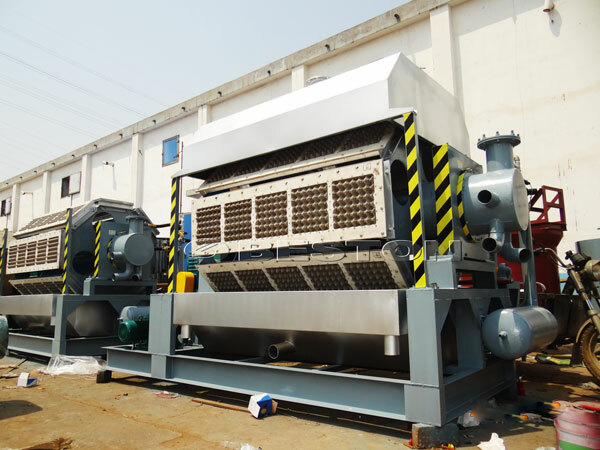 Water paper is put into hydrapulper to beat pulp around 4% consistency, pulp through virbrating screen and refiner becomes cleaned & refined, then diluted and agitated in civil works pool. Waterproof agent like AKD or rosin wax/aluminium Sulpahte, coloring diestuff may be added if required. At this stage the working pulp is to be diluted around 1% consistency. 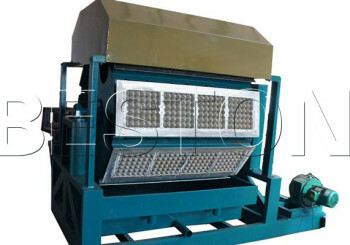 The production process of egg tray machines are necessary for your production. The ready working pulp is pumped into the pulp chest beneath the rotary molder. The molder is rotary type with each mold platen fitted with 4 egg trays molds. When the fully automatic molder rotates in 180 degree each cycle, the bottom platen’s 2 molds are immersed into pulp chest, through vacuum suction wet trays (pulp fibres) are formed and deposited on forming mold screens and excess water is returned to pulp chest for reuse. The excess pulp above pulp chest level is automatically flowed back to pulp pools for recyclable use. 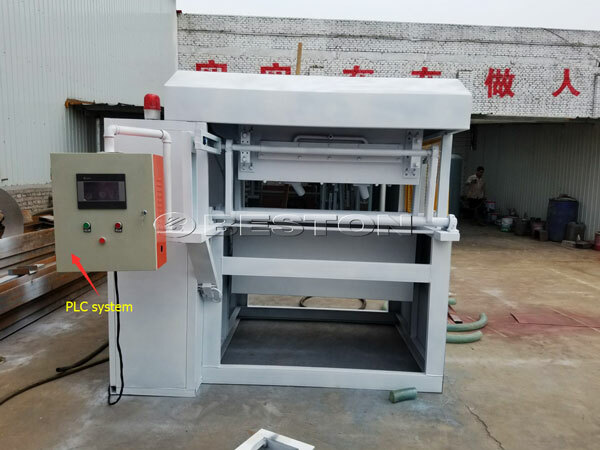 Both the front and back side of molder is fitted with high pressure water spraying system for automatic nonstop mold cleaning and egg tray edge washing each cycle. The excess white water after vacuum-suction is pumped into a civil works white water poll and this white water is re-pumped back to hydrapulper or pulp pools for recyclable use. At the front side (facing the dryer), one transfer mold platen (with 2 egg tray transfer molds) comes close to forming mold and through vacuum & compressed air the 2 wet trays are delived from forming molds (via compressed air blowing) to transfer mold (via vacuum suction). Then the transfer molds in a robot manner put wet trays (via compressed air) onto the moving dryer conveyor, and repeat another cycle. 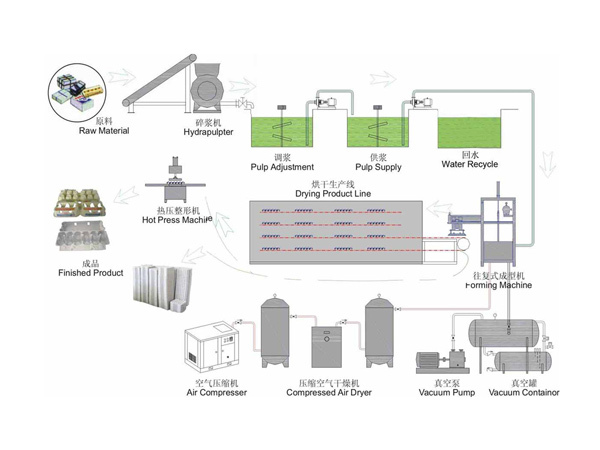 At the front side (facing the dryer), one transfer mold platen (with 2 egg tray transfer molds) comes close to forming mold and through vacuum & compressed air the 2 wet trays are delivered from forming molds (via compressed air blowing) to transfer mold (via vacuum suction). Then the transfer molds in a robot manner put wet trays (via compressed air) onto the moving dryer conveyor, and repeat another cycle. Each cycle takes 7 seconds or more depending on drying effect. The dryer is single pass tunnel conveyor type in 3 independent modules. Each module has independent gas or diesel-fired burner, temperature control, air recirculating fan & air diffuser. Each module’s temperature can be adjusted independently to reach curved drying so as to avoid tray deformation to the minimum. At the exit of drier there is facility of automatic collecting, counting and stacking of final dry trays into bundles.